With Cup Match ready to kick off at the end of next week [July 28/29] Johnny Barnes – well actually the statue bearing his likeness on East Broadway – is in the full Cup Match spirit. 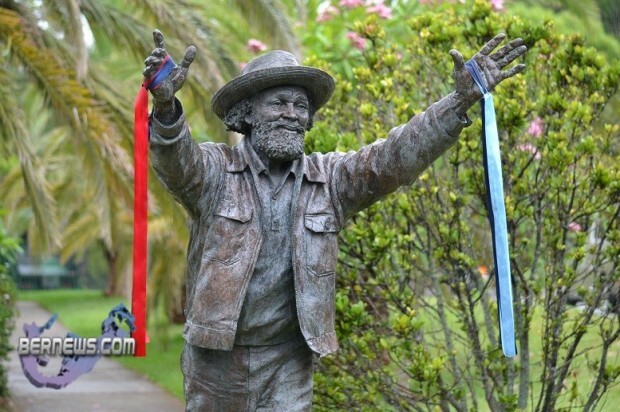 Ribbons of the traditional Cup Match colours adorn each side of the statue, greeting commuters as they head into Hamilton. those st georges ribbons are gotti GO!!!! RED & BLUE MI SEH!!!!!!!!!!!!!! I HOPE SOMERSET WINS OUT RIGHT THIS YEAR GOOD LUCK!!!! I’ll probably piss a few people off with this – but ecvery time I pass that statue I want to puke. I believe it is a slap in the face to all those Bermudians who have made real contributions for the betterment of our society. I’ve got some paint to watch dry & grass to keep an eye on too. Both are much more exciting than cricket. I mean really…any team spectator sport in which a result cannot be reached in a few hours of play is deathly boring. How many go to Cup Match for the game anyway? When was the last time there was a winner? What have you done for the “betterment” of our country?!?! This man demonstrates the epitome of humility, he gets up EVERY morning at the crack of dawn RAIN, BLOW, or SHINE just to wish morning commuters a blessed day. Have you ever thought of the person that probably feels like everything is going bad, and they can’t make it through another day and then they happen to cross this man that waves to them and tells them that he loves them. Nobody can measure how much “betterment” he’s contributed to our society, but I know that he is a great example of what Bermuda used to be like WHERE IS THE LOVE?!?!?! Just to add another point, Johnny Barnes did not ask to have a statue made in his likeness so get over yourself. I’m sure a lot of people want to puke from reading your self-serving, arrogant, and frankly uncalled for comment. If more people had that same spirit in Bermuda we would really be living in paradise. Don’t hate Johnny, do you know that tourist actually come back here because of that man, and locals are given heartfelt greetings every day; if that’s not “betterment” then I don’t know what is!!! !